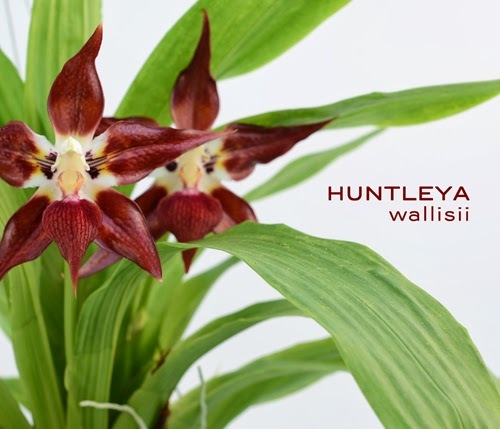 Huntleya wallisii is an undisputed star in our greenhouses. 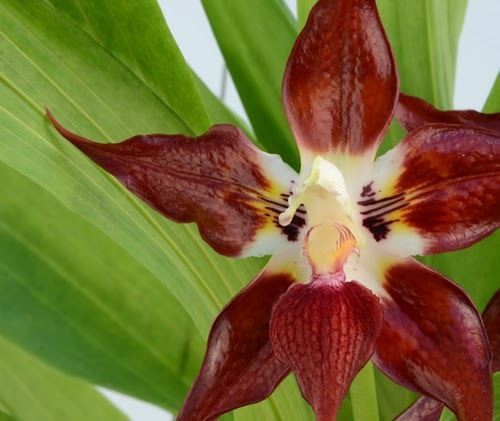 Apart from being a personal favorite of mine, it's emblematic of our collection in many ways --of our Euglossine pollinated orchids; of our long association with Marie Selby Botanical Garden and Dr Mark Whitten at UF-Gainseville; and it was one of the first orchids produced in our lab. 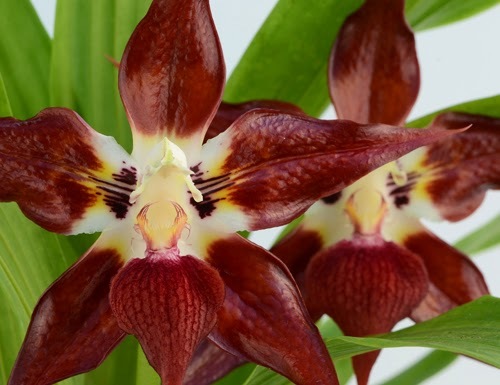 It is one of our most handsome orchids. Huntleya wallisii grows as an epiphyte in tropical wet forests at 300 to 800 meters in Colombia and Ecuador. It has fairly exacting cultural requirements, not surprising for a species so narrowly distributed. It likes very high humidity, intermediate-side-of-warm temperatures, good air movement, and good water quality. 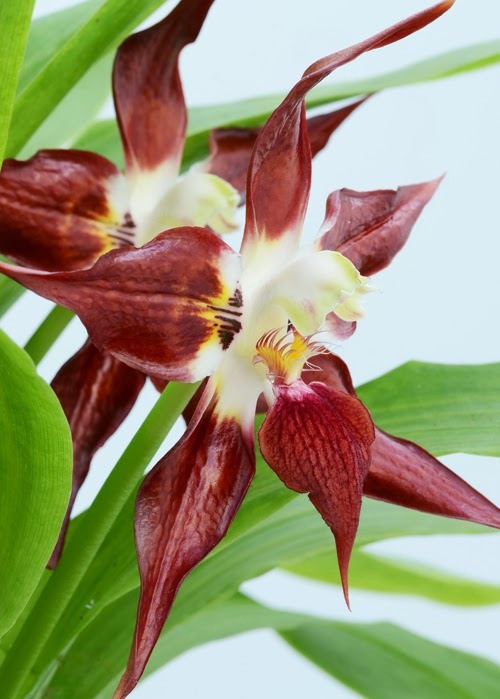 Like other orchids lacking pseudobulbs, it has little tolerance for drought. We grow our huntleyas in the back up greenhouse immediately adjacent to our propagation zone, where a high pressure fog system maintains near 90% humidity. An oscillating fan provides air movement. The wet wall is about 6' away. Shade is 80%. The nighttime minimum is 62º in winter and 68º in summer. Huntleyas and their relatives in the Zygopetalinae have thick soft roots that are easily damaged during repotting. After a couple of years experimenting with plastic net baskets (which last forever and are thus cheaper), I've resumed growing our Zygopetalinae in cedar baskets.When the wood softens, after about two years under our conditions, I can break open the baskets and remove the plants easily without root trauma. Forget the plastic net baskets unless you enjoy doing microsurgery to remove the netting that the roots have woven themselves through. Huntleya wallisii has relatively long internodes between each fan-shaped growth, so it's easy to divide. As with other rhizomatous monocots, a division consisting of a single growth has poor prospects. Much better is a division with a minimum of three fans, taken when a flush of new roots is emerging from the new growth. Gentle handling and high humidity are key.